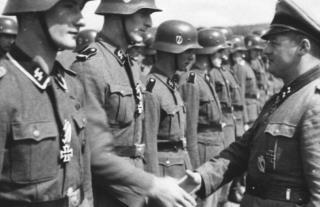 (Newser) – A senior Israeli Holocaust historian is praising Finnish authorities for publishing a report concluding that Finnish troops likely participated in the mass murder of Jews during World War II, the AP reports. Efraim Zuroff, of the Simon Wiesenthal Center, on Sunday lauded the determination of the National Archives of Finland to release its findings even if it was "painful and uncomfortable" for Finland. He called it an "example of unique and exemplary civic courage." The report concluded Finnish volunteers in Nazi forces took part in the massacre of thousands. Finland's actions contrast with those of eastern European nations engaged in a wave of World War II-era revisionism. Those countries have sought to diminish their culpability in the Holocaust while making heroes out of anti-Soviet nationalists involved in the mass killing of Jews. HA! HA! HA! not this BS again. The Holocaust story tellers and their wild fantasy's; they are the laughs that keep on coming. Finish Waffen SS troops were volunteers not conscripts. They fought exclusively on the eastern front against Russian troops and had no connection with the work camps. I give you American War Hero US Army Major Larry Thorne; Green Beret killed in action Vietnam 18 Oct. 1965. Buried with full military honors at Arlington National Cemetery. Finnish Waffen SS trooper WWII. https://en.wikipedia.org/wiki/Lauri_T%C3%B6rni I would suggest Israeli story teller Efraim Zurloff has been smoking a bad grade of pot or eating to much matzo-ball soup. War is hell. Lots of shut happens. Didn't this war end in, like, 1945? Weren't the conscripted soldiers required to act upon orders or get accused of treason, a death penalty offense? Wasn't there eventually a liberation by the allies? Haven't there been subsequent treaties that have calmed the waters and ended the overt animosity and aggression? Haven't the combatants returned to their corners (to get ready for whatever modern wars might be about to erupt)? Hell's bells, leave the Finns alone!! I'm sure they were no more interested in joining WWII than they would be in pasting red noses on all their reindeer. Finns don't know from Jews. Jews don't know from Finns. Leave this alone, awready! Oh MY!!! More people in a PAST WAR are accused of Killing their Enemy.. And Because the word JEW is used.. we are supposed to pretend the 1000X others that died during the SAME War.. Are not relevant..